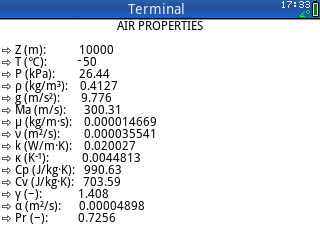 Description: Determines some physical and thermodynamic properties of air at different altitudes. Uses the international units system (SI) and considers dry air. Altitude range permitted is from -5,000 to 20,000 meters; in this range air is considered ideal gas. Description (2): Determina algunas propiedades físicas y termodinámicas del aire a diferentes altitudes, considerándolo seco e ideal. Utiliza el sistema internacional y es útil en el rango de -5,000 a 20,000 m.
Hey Jesús, I'm looking for a program tht allow me to enter with any variable nd obtain the others, can you help me with this?